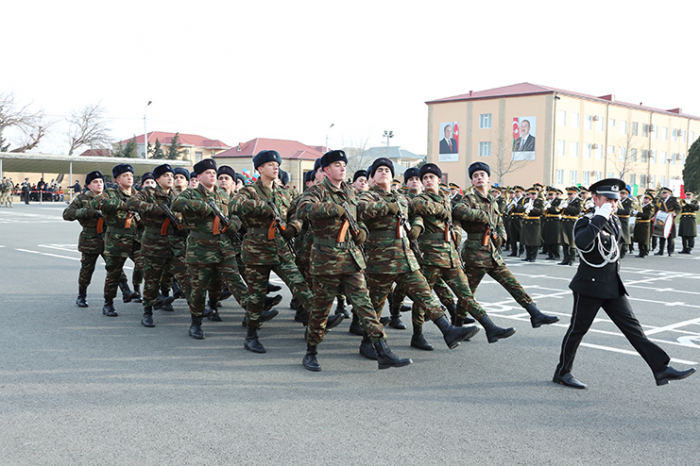 New group of army recruits took the oath of allegiance to the motherland in the N military unit of the State Security Service of Azerbaijan, Defence.az reports referring to the State Security Service. Chairman of the State Security Service, National Hero of Azerbaijan, Colonel-General Madat Guliyev and the participants of the event first honored the National Leader Heydar Aliyev’s memory and laid a wreath at the monument to the great leader. The combat flag was brought to the square to the accompaniment of the military march.The unforgettable memory of the heroic sons of Azerbaijan, who gave their lives for the independence and territorial integrity of Azerbaijan, was honored with a minute of silence. The young soldiers then solemnly took the oath. Colonel-General Madat Guliyev congratulated the personnel of the military unit and their parents on the occasion of the oath on behalf of the Supreme Commander, wished success to the officers and soldiers in their honorable and responsible service. Later, the Chairman of the State Security Service, Colonel-General Madat Guliyev met with the parents of the soldiers, once again congratulated them on this significant day. The parents expressed gratitude to the country's leadership for the conditions created for military service. Colonel-General Madat Guliyev familiarized himself with the work on the exemplary and effective organization of the service in the military unit, including mastering the results of modern achievements in the military-technical and combat fields, further increasing the knowledge and skills of the soldiers, the physical training of the soldiers, and giving appropriate recommendations and orders. The measures taken under the leadership of the Supreme Commander Ilham Aliyev constantly strengthen the defenses of the country and the military-technical potential of the Armed Forces. It is no coincidence that the Azerbaijani army is among the 50 most powerful armies in the world today, thanks to a deliberate policy pursued at the state level in the field of army building.